Bjorn Lomborg examines the long perspective on renewable energy trends. I liked this piece because it so concisely summarizes both the engineering and social realities of the popular but tragically expensive rush to solar and wind. The most renewables-intensive places in the world are also the poorest. Africa gets almost 50% of its energy from renewables, compared to just 8% for the OECD. Even the European OECD countries, at 11.8%, are below the global average. The reality is that humanity has spent recent centuries getting away from renewables. 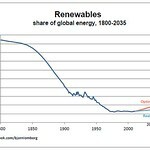 In 1800, the world obtained 94% of its energy from renewable sources. That figure has been declining ever since. The switch to fossil fuels has also had tremendous environmental benefits. Kerosene saved the whales (which had been hunted almost to extinction to provide supposedly “renewable” whale oil for lighting). Coal saved Europe’s forests. With electrification, indoor air pollution, which is much more dangerous than outdoor air pollution, disappeared in most of the developed world. And there is one environmental benefit that is often overlooked: in 1910, more than 30% of farmland in the United States was used to produce fodder for horses and mules. Tractors and cars eradicated this huge demand on farmland (while ridding cities of manure pollution). To be sure, wind and solar have increased dramatically. Since 1990, wind-generated power has grown 26% per year and solar a phenomenal 48%. But the growth has been from almost nothing to slightly more than almost nothing. In 1990, wind produced 0.0038% of the world’s energy; it is now producing 0.29%. Solar-electric power has gone from essentially zero to 0.04%. Yes, Denmark gets a record 34% of its electricity from wind. But electricity accounts for only 18% of its final energy use. Europe now gets 1% of its energy from wind – less than before industrialization, when cozy windmills contributed about 2% (and ships’ sails provided another 1%).The UK set its record for wind power in 1804, when its share reached 2.5% – almost three times its level today. Moreover, solar and wind will still contribute very little in the coming decades. In the IEA’s optimistic scenario, which assumes that the world’s governments will fulfill all of their green promises, wind will provide 1.34% of global energy by 2035, while solar will provide 0.42%. Global renewables will most likely increase by roughly 1.5 percentage points, to 14.5% by 2035. Under unrealistically optimistic assumptions, the share could increase five percentage points, to 17.9%. So we are nowhere near switching back to renewables anytime soon. In the US, renewables accounted for 9.3% of energy production in 1949. President Barack Obama’s administration expects that number, almost a century later, to increase slightly, to 10.8% by 2040. In China, renewables’ share in energy production dropped from 40% in 1971 to 11% today; in 2035, it will likely be just 9%. Consider China. Despite the country’s massive investment in solar and wind, it mostly sells solar panels to Western countries at subsidized prices. Wind makes up just 0.2% of China’s energy, and solar accounts for 0.01%. Meanwhile, China has 68% of the world’s solar water heaters on rooftops, because it is a smart and cheap technology. It needs no subsidies, and it produces 50 times more energy than all of China’s solar panels. This entry was posted in Energy Policy, Uncategorized and tagged Hansen, Renewables by Steve Darden. Bookmark the permalink.